The region where the crystal structure of the metal break. In the primary deformation zone, the heat generation is due to the plastic work done (plastic deformation) at shear plane. The high amount of heat generated in this area causes softening of the material and allowing the greater deformation. This region consumes about 70% of total energy applied. Heat generated by the secondary deformation due to the friction between the rake face and heated chip. About 20% of total energy consumed in the secondary deformation zone. This energy used to overcome the friction. In work tool interface, the heat generated by burnishing action due to the rubbing of tool flank and the machined surface. Heat generated in this region is very small as compared to another zone. 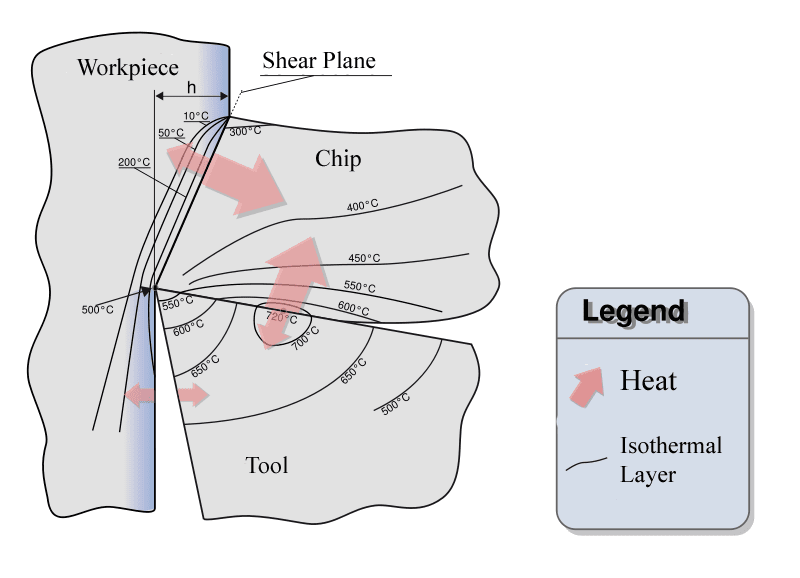 During the cutting, the chip gets heated at the primary deformation zone, and it continues until it leaves the secondary deformation zone. Thus, the maximum temperature occurs along the tool face. 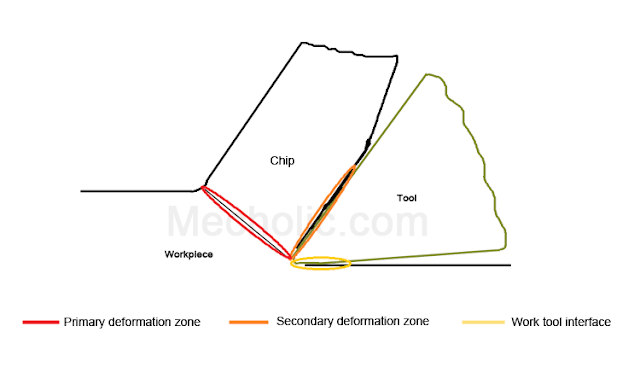 Some heat at secondary deformation zone is conducted into the body of the tool. Almost 60-70% of all heat produced while metal cutting is carried away by chips, about 20% is distributed to the workpiece, remaining distributed to cutting tool.